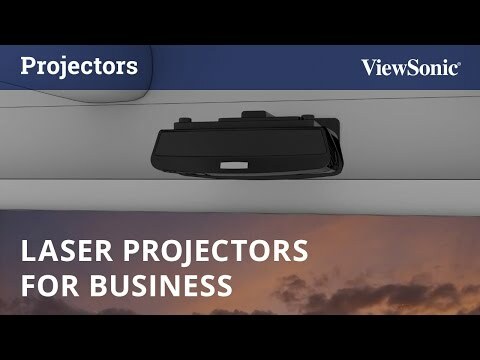 Powered by a Laser Phosphor light source system, the ViewSonic LS830 laser projector provides resource efficiency solution when compared to traditional lamp-based projectors. Pure laser lasting up to 20,000 hours which delivers long-term, virtually maintenance-free usage. Featuring 1920x1080 Full HD resolution and 4,500 ANSI Lumens of brightness, the ViewSonic LS830 Laser Projector is the ideal solution for high-end retail and luxury commercial use. With an ultra-short 0.23 throw ratio the LS830 can be placed just inches away from a wall or screen to project a huge image. High contrast ratio and pure laser light source displays superior image quality than other DLP projectors. Unlike traditional lamp based projectors, LS830 is designed with a laser phosphor light source which provides virtually maintenance-free usage for a lower overall total cost of ownership. The laser light source offers 20,000 hours of maintenance free operation, delivering reliable long-term performance with no degradation in brightness over time so that your installations are consistently vibrant. Packed with 4,500 ANSI Lumens, this projector is guaranteed to produce ultra-high brightness images that will easily accommodate even the largest spaces with high ambient light. 0.23 ultra-short throw lens allows for simple and flexible set up. Placing it as close 21cm away from a wall will project a 100” image and give the projector a subtle presence. The design of optional BrilliantColorPanel™ is light and easy to transport, consisting of a roll-able soft screen that weighs in at a mere 12.5kgs (100”), making shipping and installation simple. Laser phosphor technology provides wide color gamut coverage, delivering high-brightness and precision detail with deeper, richer colors. LS830 features Full 1080p HD color resolution for a sharp, colorful picture without pixel distortion. With options in 100” and 120” BrilliantColorPanel™ , it outputs at a 16:9 aspect ratio and offers your audience a stunning viewing experience that lends itself to the phrase bigger is better. The optional BrilliantColorPanel™ achieves a contrast ratio 4-times higher than that of an average projector screen and helps to eliminate washed out images. Engineered with innovative panel technology, the ridged surface of optional BrilliantColorPanel™ is designed to deflect 90% of ambient light while leaving the color being displayed on the screen unaffected. LS830’s speaker system comes equipped with a 3” mid-range speaker paired with a 1” silk tweeter for achieving a more balanced, lifelike sound quality. The speaker’s ported design allows sound to be thrown further for louder, more concentrated sound. Unlike traditional projector speakers, LS830’s high-volume chamber with ViewSonic’s proprietary SonicExpert® technology delivers the absolute best-in-class sound for a premium audio experience. LS830’s embedded DSP chip along with SonicMode technology is able to fine tune sound performance and provides 3 different scenario application modes to choose from. Display Size: 80" ~ 150"